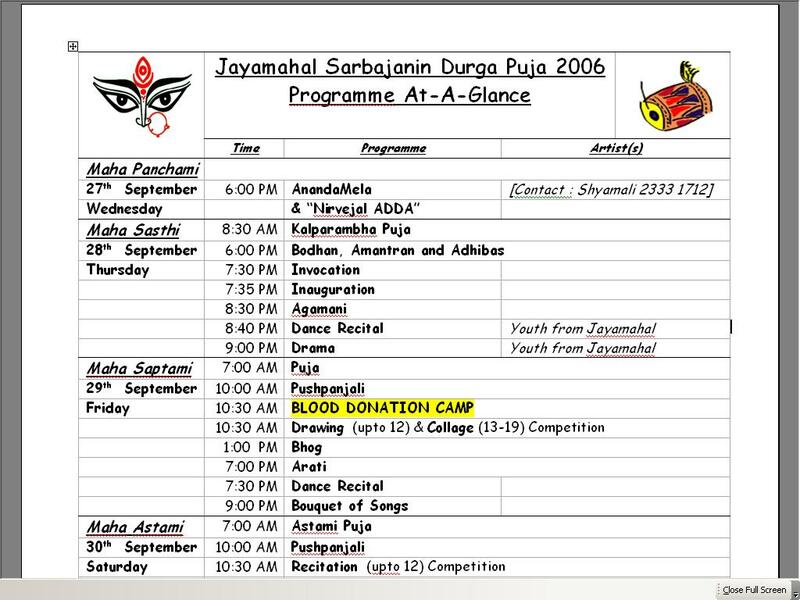 I am writing up an itinerary of Durga Pujas in Bangalore this year with an intent to witness all of them. Please comment below if you know of additional pujas in Bangalore. Air Force puja - after you enter Wind Tunnel Road from Airport Road, halfway on Wind Tunnel Road, there is a driveway that takes you into an Air Force Campus. This is probably opposite Rifco apartment. The sureshot way to not miss it is to realize that the Airforce campus wall stretches from Airport Road halfway into Wind Tunnel Road. This is typicall a small puja. But it is done in a pretty homely way. Kind of like chotto para pujas in the Bengali heartland. For those who know me, Habul was the singer (evening entertainer on one of the puja evenings) here last year. This is also a good location for the sindoor stuff on Dashami, for those who stay on Airport Road. If you travel along Bellary Road from city centre (Windsor Manor or Cauvery Theatre) towards Hebbal. As you cross the Mekhri Circle underpass, you will see an entrance to an Air Force Campus on the left side. The puja is almost just inside the gate. This is not a very large puja. But there are cultural programs in the evening. This is a multicultural puja with probably more of Hindi songs and programs than anything else. The typical route is after exiting the Command Hospital puja and moving towards Indiranagar. In the Cambridge Layout area, after crossing the Sai mandir etc, there is a lane to the left just before reaching a small bridge over a drain. This is on the way to ESI hospital and finally the SONY service centre on 100 feet road. Once you enter this lane, it winds for a few hundred metres and brings you to a municipal choultry adjacent to a temple. This is the location of the Puja. Definitely one of the bigger pujas with grand cultural programs. If you go from MG Road towards the Airport, you will notice a left turn just before Command Hospital pops up on your left. Entering this left turn you'll find yourself deep inside defence property. Few hundred metres in, there is a circle where you have to enter the hospital gate on the right. Inside you wind along towards the commotion and presently you'll find yourself at a large playground where the puja is. Not a big puja, but hosts hindi song evenings. Being a defence puja it is markedly multicultural. I guess there's one there too. Probably in the community centre. I'll have to find out details though. One of the bigger pujas. Well documented too... Read up. I am not sure if there's one, though I'd guess there is. Usually at the junction of Bannerghatta Road and Outer Ring Road in JP Nagar. A medium sized puja. This puja is a few years old and was located at Kalyana Mantapa near Ganesha Temple for last couple of years. Apparently this year they banished a subgroup for unknown reasons. This subgroup started a brand new puja. Interestingly, this new group managed to book the Kalyana Mantapa before the Real McCoys. So you'll see this new puja at the old place this year. The traditional group can be visited few hundred meters away, somewhere near the Police Station. Excellent turn of luck for Koramangalaians in terms of being able to see two pujas in one shot! I am sure there is a puja, though I'll need to figure out the route - STAY TUNED! This was pointed out to be a simple middle class puja. I remember having visited last year. Shouldn't have forgotten to include. Definitely gives a homely sense. This one was pointed out on Navami day. It is reached by taking a right turn from the top of Marathahalli railway overbridge while headed towards Whitefield (alongside the Aisshwarya apartments). It is the second year of this puja. Bengalee Association, Assaye Road. But the puja is located large open fields in the vicinity. This is the definitive uber puja. Oldest, biggest etc etc. NOT TO BE MISSED. Located at Brookefields opposite HLL in the big marriage hall. Rapidly growing puja - and walkable from my home! From Airport, proceed towards Marattahalli, cross it and proceed towards Varthur over the railway overbridge at Marattahalli. This is one straight road. After crossing the railway overbridge, about half a kilometre later the Kundalahalli traffic junction is reached. Take a left there towards ITPL. About half a kilometre ahead, the marriage hall on the left hosts this puja (landmarks on the right - opposite side of road - Lakme Beauty Salon, andhra spice restaurant, sobha IT park, Hindustan Lever's Brookefield office etc etc). Located at Inner Circle of Whitefield Village (Close to Nilgiris in Whitefield). Smaller. Multicultural with a twist - when we visited children were dancing to Tamil hits. You have missed out one of the oldest pujos in Bangalore. This is the Probashee Pujo @ malleshwaram, held every year at the Canara Union. Unlike the Bengali Association Pujo @ Ulsoor, this is more the 'Gharoa' 'Madhobitto Bangali' pujo that we all know about. You have done a great job! Only from your blog I came to know about the Malleswaram Canara Union Puja.This year I have taken membership also.Hope I can enjoy a lot this year.